Ammonium Perrhenate (APR) is a white crystalline powder represented by the formula NH4ReO4. It is soluble in water and aqueous alkalis. 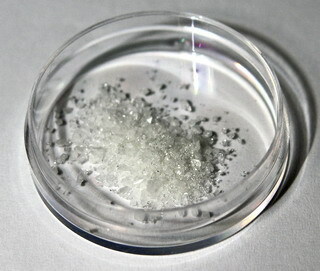 at about 300° C, and completely above 400° C.
It is an important base rhenium chemical. Rhenium metal is formed by reduction of Ammonium Perrhenate with Hydrogen at high temperatures.